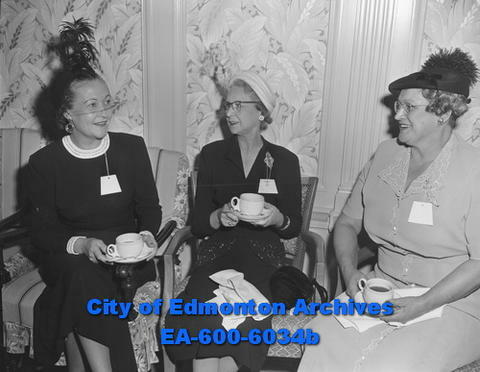 Item EA-600-6034b - Wives of Shriners enjoy tea at HBC Empire Room: (L-R) Mrs. W.H. Harper, Mrs. Lloyd Werner and Mrs. David Little. Wives of Shriners enjoy tea at HBC Empire Room: (L-R) Mrs. W.H. Harper, Mrs. Lloyd Werner and Mrs. David Little.